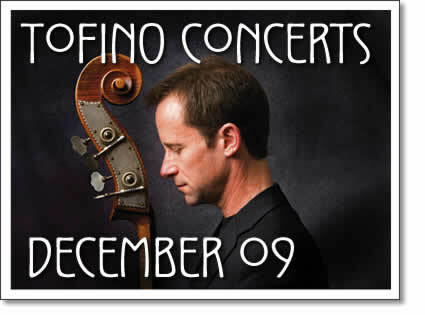 The following concerts in Tofino are happening in the month of December 2009. Tickets are available at Tofitian and Long Beach Surfshop in Tofino. Visit our Tofino concerts page for concert listings for the current month. Also check our Tofino events for listings of all local events and the Tofino festival page for our festival event calendar and for events during the the West Coast Winter Music Series. Now in its 10th year, the West Coast Winter Music Series is planned and programmed by a dedicated group of volunteers who just happen to love music of all kinds, but classical music in particular. They are a non-profit group whose revenues are put back into paying the artists and providing travel and accomodation fees for them to perform in Tofino. For more information on tickets and or subscriptions contact Judi at 250.725.3373.
banging bouncy dancefloor goodness. Tarun is also founding member of Beats Without Borders and has shared the stage with everyone from De La Soul to Cheb i Sabbah. His tracks and mashups get play on the CBC, BBC and college stations worldwide. He's just completed production on his first solo album, available in the new year. Tofino concert listings from Tofino Time Magazine. Shows at the Tofino Legion and other music events in Tofino in December 2009.